Millions of viewers watched Megan ’92 and Scott Reamer ’93 fist bump and smile with relief on Sunday as they walked off the high-pressure “Shark Tank” set. They pitched Jackson’s Honest, a snack-food company named for their eldest son, to a panel of five potential backers in the hopes of gaining monetary support and mentorship. Millionaire marketer Rohan Oza, the branding mastermind behind Vitamin Water and Pop Chips, saw an opportunity and agreed to make a $1.25 million investment in their business. Although four of the sharks didn’t take a bite, citing how difficult it is to break through the crowded grocery space, all of the financiers said how impressed they were with the product—especially in light of the circumstances in which the Reamers built the business. 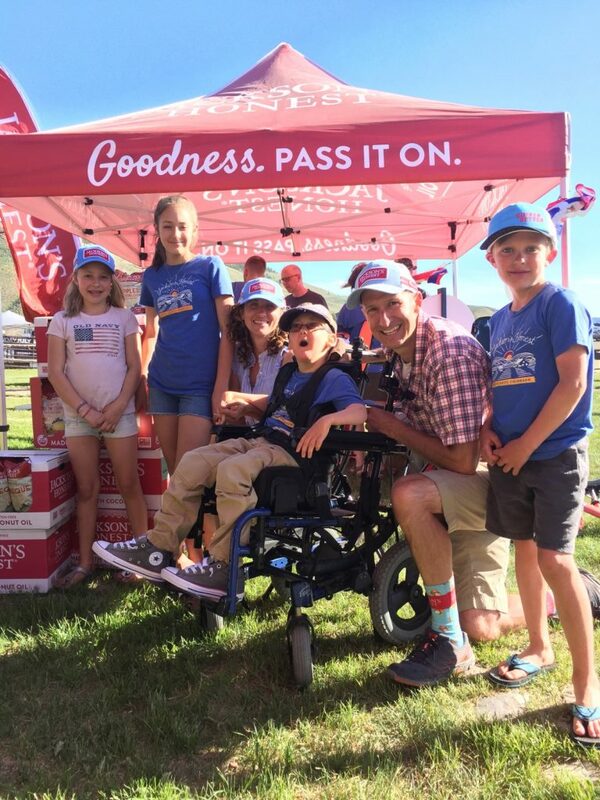 Megan and Scott founded Jackson’s Honest, a line of nutrient-dense snack chips fried in coconut oil, rather than the standard highly processed polyunsaturated vegetable oils, after seeing how a diet in quality “good” fats benefited their ailing son. Jackson suffered from an extremely rare disorder called Aicardi-Goutières syndrome, which caused inflammation in his brain. A diet rich in coconut oil improved his quality of life, which motivated the Reamers to turn the family’s favorite snack into a brand they could share with others. Sadly, Jackson passed away at age 16 on Aug. 13, just days after the “Shark Tank” crew visited the family in Crested Butte, Colo., to capture footage of them at home. The Reamers were invited to appear on “Shark Tank” in March after an ABC producer read about their company and its touching backstory. Megan, an English graduate, and Scott, a chemical engineering graduate, managed to turn a recipe they cooked on their stovetop into a thriving operation. Today, Jackson’s Honest is a $10 million enterprise with three facilities, eight full-time employees, and products on the shelves of top-line stores, including Wegmans and Whole Foods, across the country. As well-established business owners, the Reamers aren’t your typical “Shark Tank” contestants. The show receives about 40,000 applications each season from wanna-be entrepreneurs who pitch the show’s panel of tycoons in the hope of gaining capital to launch their business. Megan and Scott initially dismissed the show’s invite to appear, assuming that Jackson’s Honest was too big and mature for the show. But producers explained that they wanted to broaden their scope and start featuring companies at various stages of growth that could still benefit from “shark” funding and mentorship. Scott adds that the “Shark Tank” experience will also further their business acumen. Scott and Megan, who met at Lafayette in 1990, traveled to Los Angeles this summer to tape the on-set portion of their segment, where they met the show’s “sharks” and presented their story. They are grateful for the positive feedback they received. With Oza’s expertise, the Reamers are excited about the growth opportunities ahead. And not just for their bottom line. The Reamers founded the Jackson’s Honest Charitable Foundation, which supports patients with Aicardi-Goutières syndrome. In February, in honor of Rare Disease Month, Jackson’s Honest donates all of its online proceeds to support the treatment of rare diseases. “We are hopeful that the exposure we get from ‘Shark Tank’ will help us advance our charitable efforts,” Megan says.